Large rest area with platform support. Platform support for Dolomite Alpha models only. 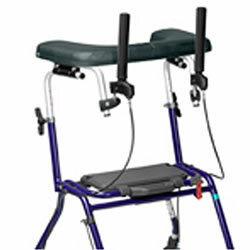 The Alpha Platform Support is an accessory for the existing Dolomite Alpha Basic or Dolomite Alpha Advanced walkers - without affecting the unique adjustments. Dolomite Alpha is a family of solutions giving added support for gait training, arthritis, orthopaedic needs, after surgery and ... Alpha does not only offer an excellent support, when other products fail to give the right arm positioning or functioning handles Dolomite Alpha is the product to try.